Edith Lee-Payne doesn't remember having her photo taken at the March on Washington. What she does remember about that day, she says, is being "glad to be standing with people who wanted to make things right." Through The Race Card Project's six-word stories, we'll meet some of the people who witnessed that history and hear their memories and reflections on race relations in America today. Many images from the 1963 March on Washington for Jobs and Freedom have taken on iconic status. One of them is a photo of a young black girl attending the march. You may have seen this picture, because it has been used in documentaries, textbooks and museum exhibits. She has short hair with bangs and is holding a black and white banner. The girl is not smiling; in fact, it's hard to put a finger on her emotions — anger? Impatience? Sorrow? Rowland Scherman is the freelance photographer who snapped that picture while on assignment for the U.S. Information Agency. He was taking photos and saw a girl in the front row of a crowd near where Martin Luther King Jr. made his "I Have a Dream" speech. "And I see some people laughing, and some people crying and some people earnest. And ... not only was she beautiful, but she was so involved," Scherman says. The girl in that picture is Edith Lee-Payne. She's from Detroit, and the day of the March was her 12th birthday. For decades, she had no idea that she'd become a poster child for the civil rights movement. But in October 2008, her cousin spotted the picture on the back of a black history calendar. "And she phoned to tell me, and I didn't believe her," Lee-Payne says. "Because also on the front cover, as well as the back, were pictures of Frederick Douglass, Dr. Martin Luther King, Sojourner Truth, Jesse Owens and a number of other very well-known people. So why would my face be with theirs?" Then, Lee-Payne looked it up online. "So I immediately went to my computer, pulled it up, and lo and behold, there was this calendar image of the front and back cover of the calendar with my face on it." Lee-Payne still has the black and white banner she's holding in the picture. In the top left corner it says, "I was there." The famous photo provides eternal proof that she was indeed at the March on Washington. The picture now lives at the National Archives. Lee-Payne has her own copy, personally signed by the photographer. Even without that photographic testament, the day is seared into her memory. "It was important for my mother to be there," Lee-Payne says. "And being her one and only child, it was important for me to be there with her." Lee-Payne's family arrived at the National Mall early on Aug. 28. Her namesake, her Aunt Edith, was volunteering at the Red Cross tent and had to check in well ahead of the crowds, which helps explain why she had such a choice spot toward the front. Lee-Payne's mother had once worked as an entertainer and knew a lot of people in show business. She was a dancer who opened for Cab Calloway, and she sometimes baby-sat for Sammy Davis Jr. when he was just a child star. Lee-Payne and her mother's vantage point near the entry to the stage allowed her mom to catch up with old friends, Lee-Payne says. "Lena Horne came over where we were standing to talk to my mother, and in listening to them [it] was my first experience in learning some of the things that my mother had been subjected to," Lee-Payne recalls. "Having to enter hotels through the back door, in things that they saw, in driving in a bus or on a train going from one state or city to the other. Those were things that my mother had never shared with me." She had talked about being an entertainer, Lee-Payne says, but not about the hardship of being a black entertainer. Horne and Lee-Payne's mother didn't talk for a very long time, Lee-Payne says, "but they talked about the purpose for being there and what it meant to them, so in sharing those things, it was enlightening to me." When Lee-Payne heard King talk about his dream for America, she indeed felt that her life embodied some of what he envisioned. "I already lived that. I was able to go to integrated schools. When I was 5, 6, 7 years old, my next-door neighbors were white. Whenever we got on the bus, there was never any issue about where we sat," Lee-Payne says. "We would frequently eat out and sit at lunch counters served by black and white waitresses. There were never any incidents. Being at that march, I guess I was kind of glad to be standing with people that wanted to make things right." Looking For Leadership To "Move Us Forward"
But as Lee-Payne moved into adulthood, she says, that dream felt like it started to disintegrate. She did well in school and studied business administration. But, she says, when she went searching for work as a secretary, the content of her resume was overshadowed by the color of her skin. "I was denied employment at least 50 times, only — only — because I was black. As soon as I'd walk through the door, and the employer would see me, I would be told that the job had already been filled, or I probably wouldn't like the job anyway, or they need to reschedule something," Lee-Payne says. "And it was just obvious in the few people that I could see in the office. ... And I never saw African-American women in those positions." Lee-Payne eventually found work at Eastman Kodak. Over the years she has also worked as a civic activist, mainly in Detroit. The exasperation captured in that photo of a young Edith Lee-Payne, then Edith Lee, still hovers over her heart — made clear when asked to share her thoughts on race relations in America today. Her six words for The Race Card Project: "Marches, jobs, freedom and justice? Not." "Instead of seeing the equality and the justice and the freedom and jobs that we should really have 50 years later, it's not there in a lot of places — I can't say everywhere," Lee-Payne says. "What we don't have now that we had then, is the kind of leadership to kind of bring it together, to kind of help move us forward." Lee-Payne is still working toward change. Her to-do list is still long, so this Aug. 28, she will once again spend her birthday in Washington at the Lincoln Memorial. "There's no place that I could be, other than there," she says. "It's too personal for me." It's time again for the Race Card Project. This month, we're reaching back in time to examine the 1963 March on Washington. Over a quarter of a million demonstrators streamed into the nation's capital. Today, NPR's Michele Norris spends time with one face in that crowd. MICHELE NORRIS, BYLINE: We're going to focus on a single picture that's taken on iconic status. You may well have seen this picture because it's been used in documentaries and textbooks and museum exhibits. 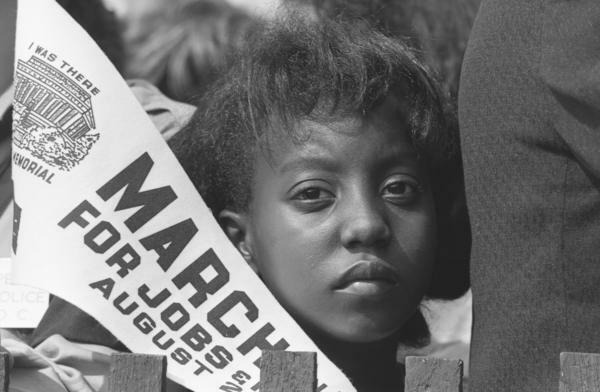 It's a photo of a young black girl attending the March on Washington. She had short hair with bangs. She's holding a black and white banner. She's not smiling. In fact, it's hard to put a finger on the emotion she displays with her pursed lips and heavy eyelids. ROWLAND SCHERMAN: And I see some people laughing, and some people crying and some people earnest. And she was one of the ones, not only was she beautiful, but she was so involved. NORRIS: Rowland Scherman is the freelance photographer who snapped that picture. He was on assignment for the U.S. Information Agency. Edith Lee-Payne is the girl in that picture. She's from Detroit. She was just 12 years old. And for decades she had no idea she'd become a poster child for the civil rights movement. In October of 2008, her cousin spotted the picture on a calendar. EDITH LEE-PAYNE: There was a black history calendar that had that picture of me on the back cover. And she phoned to tell me and I didn't believe her because also on the front cover, as well as the back, were pictures of Frederick Douglass, Dr. Martin Luther King, Sojourner Truth, Jesse Owens, and a number of other very well-known people. So why would my face be with theirs? NORRIS: Edith Lee-Payne did not believe her cousin until she looked it up online. LEE-PAYNE: So I immediately went to my computer, pulled it up, and lo and behold, there was this calendar image of the front and back cover of the calendar with my face on it. NORRIS: It was her. She still has the black and white banner she's holding in the picture. In the top lefthand corner it says: I was there. The famous photo provides eternal proof that she was indeed at the March on Washington. That picture now lives at the National Archives. Edith Lee-Payne has her own copy, personally signed by the photographer. Even without that photographic testament, the day is seared into her memory. LEE-PAYNE: It was important for my mother to be there. And being her one and only child, it was important for me to be there with her. NORRIS: August 28th, 1963 was Edith Lee-Payne's birthday. Her family arrived at the National Mall early. Her Aunt Edith, her namesake, was volunteering at the Red Cross tent and had to check in well ahead of the crowds. That helps explain why Edith Lee-Payne had a choice spot toward the front. Her mother had once worked as an entertainer and she knew a lot of people in show business. She was a dancer who opened for Cab Calloway, and she sometimes baby-sat for Sammy Davis, Jr. when he was just a child star. Their vantage point near the entry to the stage allowed her mom to catch up with old friends. LEE-PAYNE: Lena Horne came over where we were standing to talk to my mother, and listening to them was my first experience in learning some of the things that my mother had been subjected to in having to enter hotels through the back door, in things that they saw, in driving in a bus or on a train going from one state or city to the other. Those were things that my mother had never shared with me. She always talked about being an entertainer. I remembered seeing her old silver tap shoes, you know, and just talking about her experiences. And they didn't talk for a very long time, but they talked about the purpose for being there and what it meant to them, and so in sharing those things it was enlightening to me. NORRIS: When Edith Lee-Payne heard Dr. King talk about his dream for America, she indeed felt that her life embodied some of what he envisioned. LEE-PAYNE: I already lived that. I was able to go to integrated schools. When I was five, six, seven years old, my next-door neighbors were white. Whenever we got on the bus, there was never any issue about where we sat. We would frequently eat out and sit at lunch counters served by black and white waitresses. There were never any incidents. Being at that march, I guess I was kind of glad to be standing with people that wanted to make things right. NORRIS: As she moved into adulthood, that dream felt like it started to disintegrate. She did well in school and studied business administration. But when she went searching for work as a secretary, she claims that the content of her resume was overshadowed by the color of her skin. LEE-PAYNE: I was denied employment at least 50 times, only - only because I was black. As soon as I'd walk through the door and the employer would see me, I would be told that the job had already been filled, or I probably wouldn't like the job anyway, or they need to reschedule something. And it was just obvious in the few people that I could see in the office. And by the way, the job that I was applying for was a secretary or an executive secretary. That was what I majored in in college, business administration, and that's what I wanted to do. That's what I enjoyed. And I never saw African-American women in those positions. LEE-PAYNE: "Marches, jobs, freedom and justice - not." Instead of seeing the equality and the justice and the freedom and jobs that we should really have 50 years later, it's not there - in a lot of places. I can't say everywhere. It's not there. What we don't have now that we had then was the leadership to kind of bring it together, to kind of help move us forward. NORRIS: Edith Lee-Payne is still working toward change. Her to-do list back in Detroit is still long. This August 28th, she will once again spend her birthday in Washington at the Lincoln Memorial. LEE-PAYNE: There's no place that I could be other than there. It's too personal for me. MONTAGNE: That's Edith Lee-Payne. She spoke with NPR's Michele Norris, curator of the Race Card Project in partnership with NPR. You can learn more about the project at NPR.org. Transcript provided by NPR, Copyright NPR.